Ed.Flicks Exchange Training Videos on Demand puts the power of video in your hands for all your professional development needs. Your subscription gives you access to a growing library of high quality early childhood video training segments you can use in small group presentations, PowerPoint presentations, and online learning platforms. 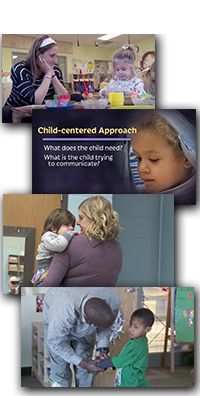 If you are responsible for training early childhood professionals, this is a must-have resource. Your subscription to Ed.Flicks gives you immediate access to over 140 two- to twelve-minute video segments on addressing challenging behaviors, preventing obesity, family partnership, infant and toddler care, child assessment, teacher performance and much more. The Ed.Flicks library will continually grow as new video segments are added regularly. Two affordable individual subscription options are available for a single professor, trainer, or center. All plans include streaming access which allows you to view the videos right on the Exchange website. The Streaming and Downloading option allows you to download the videos and play them without an internet connection in a live training session, incorporate them into a PowerPoint presentation, or use them in an online learning platform. Let us help you create a subscription that meets the needs of your multi-site organization, resource and referral agency, state agency, or training organization.